Aliens imagined to have visited us in the past are generally seen just like humans—nothing like the God of the Bible. The 2012 film Prometheus isn’t even close to the only media that discusses aliens coming to Earth in ancient times–if nothing else, the History Channel’s Ancient Aliens has been on the air for about twelve years. But the movie is one of science fiction’s most recent and noteworthy portrayals of aliens having come to Earth long ago and deeply affecting humanity. In most versions of this kind of story, aliens visiting Earth greatly affected human cultures, but Prometheus takes this idea one step further. Aliens did not simply influence some rock paintings and possibly inspire some legends and myths about gods and/or monsters, they actually founded the human race. Though they essentially copied themselves in a slightly altered fashion to do so, since they are beings who have DNA which is shown to match human DNA. Fictional cave art from Prometheus (2012): aliens giving out a star chart for humans to follow. I would think it would be more impressive to think of Thoth, the ibis-headed god of Egypt who was seen as the founder of the art of writing, as being an alien. This was part of Stanley Weinbaum’s 1934 science fiction short story, Valley of Dreams (the ancient bird-headed aliens who had visited ancient Earth in that story were Martians. Naturally). At least in a case like that you ‘d be maintaining something truly different from us (in at least physical form) deeply affected our culture, which is an interesting idea. Maintaining that a race virtually identical to our race created us or influenced us is by contrast a rather strange and underwhelming backstory (we made us? really?–then who made the “us” who made us?). The reason ancient alien stories are appealing to many people is they fall in line with common ideas about evolution. So if the inanimate universe, without a purpose or plan, created human life, why would it not create other life? And if other life, alien life, was indeed spontaneously belched forth by the unplanned stirring of just the right chemicals under the right conditions, who is to say aliens would not have traveled the stars when the human race had just begun to build stone houses and mud huts? And we can also imagine that our present selves would be awe-inspiring to stone age or bronze age man. That our tech would wow them and they would see us as gods (I rather think most ancient people would see us as human in a heartbeat–though they might think of us as favored by the gods because of some of the tech we have). This relates to old applications of Darwinism that not even Darwinists agree is true–ideas of societal and cultural evolution. The notions that our culture is getting better over time, that our modern morality is automatically better than the old simply because it is newer, and that some day we will be so advanced that we would be unable to recognize ourselves. So–some people imagine that aliens have done this previously. Before our own civilization flourished, extraterrestrials became so advanced that humans as we were then could not recognize the aliens for what they really were–simply a more advanced civilization. Instead we saw gods–or perhaps monsters. But notice what kind of alien generally inhabits this kind of thinking. They’re actually projections of the human race, not as we really are, but as many people perceive us to be. These people imagine the human race to have spontaneously evolved without any real purpose or plan–and see our ancient alien visitors has having done the same. They imagine the human race went through a long period of growth and development. And see the ancient aliens in the same way. They believe that modern man would be awe-inspiring to the humans of the past (and we will be even more so in the future) and see the supposed ancient alien visitors in the same light. Yes, these aliens are almost always thought of as being physically different from us, but note that in modern thought our form is simply an accident caused by a series of events in our evolution. Since there’s nothing special about who we are physically, we could well have turned out different. Perhaps even having heads that look like an ibis. So the aliens imagined to have visited us in the past are in that way just like humans. Every bit as much a product of the machinery of the universe. This sort of thinking is in effect simply a projection of who these people believe the human race to be, imagining our analogs existing in the past. The type of aliens that are what I called in part 1 of this series an exaggerated version of human beings. Modern man no longer creates gods in his own image as the Pagans did, but does imagine aliens who are essentially in his image, who are given the roles the ancient Pagan gods had. God is much more alien than that. Our Creator is not a version of us projected into the past, who advanced just like we think of ourselves as advancing. God is something altogether different from us–altogether outside of time and having no need to progress to any higher form. Which is something some science fiction captures–but which “ancient alien” notions do not perceive. Next time we will look at how the modern UFO phenomenon relates to this topic: Do the aliens people say they meet have any connection with the concept of our God being alien to the human race? But for now, what do you think of this topic? Do you believe there’s any validity to ancient ancient alien theories? How do you explain Bible passages like Ezekiel chapter 1, where some people claim the Bible describes a UFO (i.e. aliens visiting Earth in ancient times)? What do you think of how the film Prometheus tackles this issue? Any other thoughts? I love this series, Travis. I related in another comment that I hated the movie Prometheus but that had more to do with the philosophical bents of the movie (which in other medium, I would have been fine with. I just wanted to see an alien burst through someone’s chest and that didn’t happen until the end — lame!) as it relates to the same old song that we’re not really special. Prometheus makes Dr. Elizabeth Shaw, by the end of the movie, try to hold on to her faith in ‘God’ even though evidence points to a god that hates us. Hates us so much he snaps folks’ necks. So much for a loving god, eh? Yet, God does not regret (for the lack of a better term) the creation of man when we fall. He doesn’t destroy us. He comes down as a human (unlike the aliens we have ‘come up’ to) and saves us. As you note in your post, a lot of these ancient aliens aren’t spectacular. They may or may not look like us. They have better tech (supposedly) and we’re just mimicking them until one day, we’ll run around on another planet, dropping DNA life balls by accident before the bus leaves to carry us home. They aren’t special. And if you’re not special or unique, just an accident or a purposeless product of mindless process, then none of your individual aspirations, or struggles mean anything. The alien idea of God, as a Creator, who made each us special and unique, who isn’t simply a projection of our ‘exalted selves’ flies in the face of this type of nihilistic rhetoric. I hope I didn’t ramble on too much. This is of course why understanding these things really matter. A spiritual war is going on, and is being fought to a large extent in the ideas and understandings of human beings. And yes, one purpose the enemy has in these ancient alien notions is to convince people that we human beings do not really matter–therefore there is no reason we should refrain from thinking we cannot do whatever we want (especially in terms of gratifying our lusts). Thanks for your comments, Parker. I really appreciate them. Both of you — Travis, Parker — have nailed it. “Aliens” are indeed the new “gods” today, cast in our own flawed and fallen image, and nihilism is precisely where you end up by doing so. Superb analysis and so sadly true. Yes, aliens are the new gods…though efforts to revive the old gods of paganism are also ongoing. It’s really astounding how many Neo-Pagans there are in the world. Not to mention the rise in Eastern Mysticism as well. ANYTHING but the God of the Bible is the direction the world is going. Which is not really new, since Satan has been around for some time now–but rebellion against God has taken on new aspects in recent years. 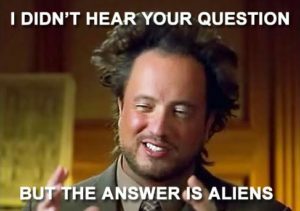 I think half the reason Ancient Aliens was/is on for 12 years is that it’s cheap to produce by recycling the same footage a dozen times with different voiceovers and then paying Crazy Hair with the producers’ leftover weed.